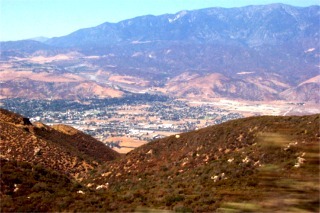 This run started in Riverside, went through the back roads up to Idyllwild, from there through Banning. After Banning we went to Oak Glenn for a picnic lunch at Apple Dumpling and ended up at the Rt 66 Rendezvous in San Bernardino. This shot was taken at the grounds of the Apple Dumplin Restaurant. Karen is sitting down kind of off to the left enjoying her apple pie. Oak Glenn is an area known for it's apple orchards and apple pie..
And still more, but... 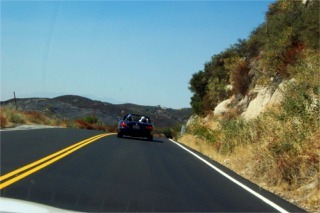 I included this one cause as you can see the hillside straight ahead burned out. I had a picture of this some time ago on a bike trip. 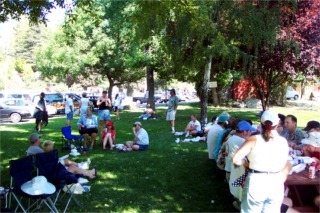 The following photos are taken at the Rt 66 Rendezvous. Man, there were like 4,000 cars there. It was huge. We were only there for about an hour as after a long day of touring we were tired. 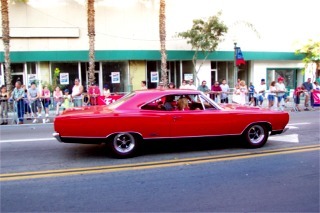 My all time favorite care was the 68 Plymouth Road Runner. I drove one once with the 440 6-pack. Man was it fast. But there was something wrong with it so I didn't buy it. I was about 17 at the time. This is a 68 GTX. Frankly I'm not sure what the differences were. They sure looked a lot the same. If you look closely you will notice there are two rods the same. One normal size and one the guy built for his kids. It had a single cylinder engine that seemed to have quite a bit of torque. I think the guy had it geared for that. It was kind of cute to see the father giving them directions on what to do as they paraded around and I assure you the kids were having a ball. 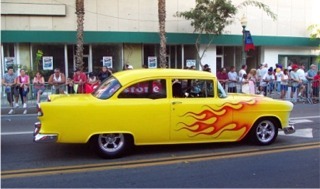 And a cool 55 Chevy. 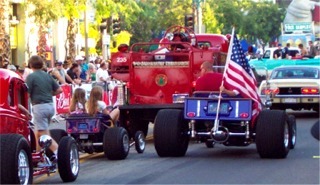 They had a lap around the town that was about 1 to 2 miles long. At a point in front of the judges they would stop and rev the car up to see who had the loudest car. The rest of the time they would just drive around the crowds. You could sit and just watch the parade of different cars go by or walk around and look.